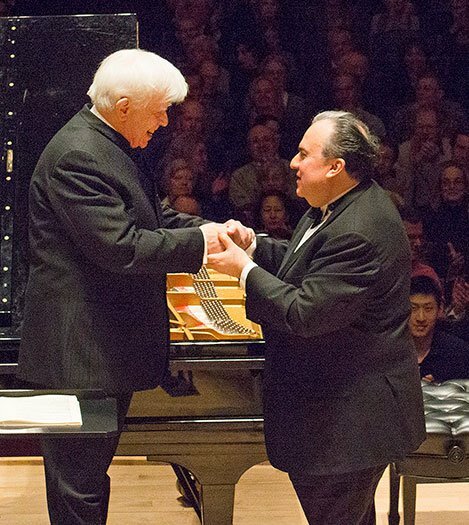 Saturday night, in the second of three programs devoted to performances of the complete Beethoven piano concertos, Christoph von Dohnányi and Yefim (“Fima”) Bronfman performed the 3rd and 4th concertos with the BSO at Symphony Hall with richness, elegance, emotional depth, and uncommon understanding. Each of the three concerts in the series is preceded by one of the Leonore overtures. Saturday’s program opened with the Leonore Overture No. 2, the first in order of composition and the longest of the three. Von Dohnányi reminded us that it is not a preliminary and distorted version of the No. 3, but is a work of its own, symphonic in scope. It was played on a grand scale, with strong contrasts in dynamics, explosive and intuitive. Beethoven’s C minor piano concerto, with its clear debt to Mozart’s C minor K. 491, is a transitional work, as far ahead of the C major Op. 15 as that work is from the (earlier) B-flat major Op. 19. Von Dohnányi and Bronfman brought out the elegance of this work, Bronfman playing with a lyrical yearning, the phrasing smooth and silky. The BSO response was light but mysterious, with sudden impetuous outbursts. Even in the cadenza, Bronfman remained quietly emotional, his face revealing a depth of feeling that flowed into his fingers with singular authority. The ensuing Largo opened with a beautifully carried, long melodic line in the piano, the orchestral response throughout was simultaneously lush, romantic, and clear. The Rondo finale was played with grit and fine humor, emphasizing the dancelike accents and the limbic rhythms, all leading to the final joke of a fake cadenza followed by a mad rush for the exits. It received a very enthusiastic ovation. As Lockwood writes, Beethoven’s Piano Concerto No. 4 in G major, Op. 58 “sustains a plateau of quiet beauty from beginning to end.” This performance, however, went beyond beauty, revealing an emotional intelligence and unity in the work that I had never heard before. Words alone are inadequate to describe fully the layers of complexity in this performance. Immediately from the piano’s opening statement and the pp reply from the orchestra, Bronfman and the BSO together gave it a searching, questioning character, a mutual probing that continued throughout the Allegro. The prayer-like tone became a plea for meaning, orchestra and soloist transferring affect to each other, each time with increased understanding and moments of almost overwhelming ecstasy. The final cadence of the first movement came as a determined statement of persistence. 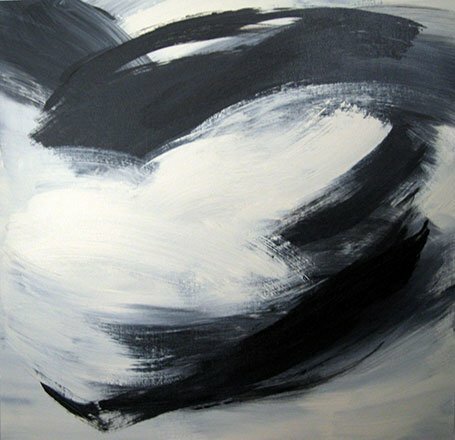 The ensuing Andante conveyed a mature, dark awareness of fate, tinged with anguish. The orchestra remained anxious and agitated, the piano’s eloquent phrasing absorbing the angst of the troubled strings, but then itself taking on the agitation. The exchange was elegiac, solemn and heartfelt, ending on an enigmatic note. The Rondo finale came as a release, building to a rapturous delight, almost cathartic with a quiet joy then bursting with wondrous vitality. A principle of life/energy took over, yet the piano remained mindful of inner resources of lyricism. The development episode especially was forceful, assertive, liberated, the orchestra absorbing the piano’s energy and becoming infused with force. The cadenza solo was a long-awaited expelling of the tensions that had built through the first two movements. Piano and orchestra together soared in the pianissimo ending statement that built to a triumphant final cadence. Again the audience responded enthusiastically, with a unanimous standing ovation. Thank you for this wonderful review of what was truly, a performance for the ages – especially in the case of No. 4. Bronfman’s trills and pianissimos (and the BSO’s as well) were astoundingly beautiful. I’m not sure I would characterized the second movement as “elegiac” – perhaps as “quiet diplomacy”. The piano didn’t simply win the dialogue with the orchestra, but the individual voice continued to assert itself quietly, eventually winning the heart of the savage beast. This truly was a Beethovenian moment – when the dignity of the individual convinced the collective masses of the need for joyous brotherhood. And what joy was brought forth in the rondo! I found myself swept up, on my feet in a way that I have experienced only with the finales of the 5th, 7th and 9th symphoniesI agree wholeheartedly that the performance “…went beyond beauty, revealing an emotional intelligence and unity in the work that I had never heard before.” How is it that we can experience these musical epiphanies after decades of listening to a work? Bronfman is a musician’s musician – stately and calm at the keyboard, all of his massive energy goes into his hands and fingers. He deserves wider recognition. I was pleased to see him receive a well deserved spontaneous – and obviously heartfelt – ovation at the end of the concert. And if this is the level of playing we can expect to hear from the BSO over the course of this season and the next, we may be entering a new Golden Age. I am still lost, hours later, in the fourth concerto. The performance was essential, Bronfman seemingly conjuring the music from his abdomen (and he knows how to play for that hall). Magnificent. Does anybody else notice the phrase from the “Laudate Dominum” of Mozart’s Vesperæ Solemnes de Confessore which crops up a couple of times in the slow movement of the Beethoven Piano Concerto No. 3? If so, do they attribute it to coincidence or to Beethoven’s having possibly heard the Vesperæ and the phrase having settled in his unconscious? Leon, I am so honored you thought of me–thank you!! Of course your words paint a far more exquisite picture of the piano piece,… while stimulating fascinating discussion, as always! I completely agree about the “Laudate Dominum”–but then again, Beethoven invented original inventiveness itself! His musical references are like Van Gogh’s “copies” of Millet…. Thank you for the marvelous experience of reading you, every time!